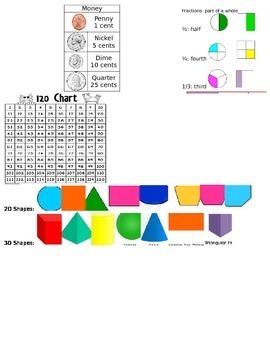 I created this cheat sheet for each student have handy with them at their desk at all times. 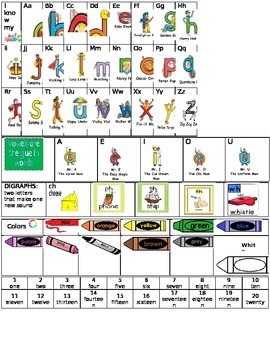 This cheat sheet includes the alphabet (including letterland pictures), vowels (with the letterland vowel men), digraphs (ch, ph, sh, th, wh), colors with words, numbers with words, months of the year, days of the week, a writers checklist (capital letters, spaces, punctuation, readable), a mini word wall with first grade high frequency words, 120 chart, fractions, and 2D/3D shapes. 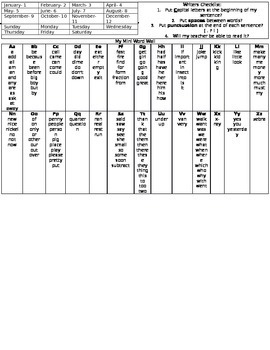 **Thumbnails do not reflect actual format. There are only 2 pages and everything fit perfectly!